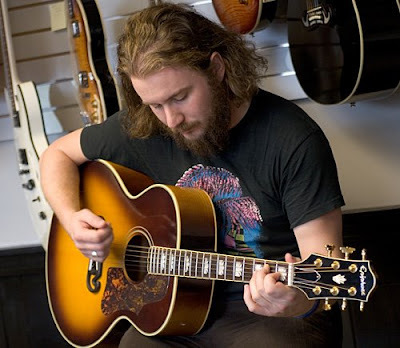 ElectricMustache - Indie Rock Blog: mp3: Yim Yames - "Behind That Locked Door"
mp3: Yim Yames - "Behind That Locked Door"
Turns out that Jim James of My Morning Jacket is a huge fan of George Harrison. So much so that shortly after the former Beatles death in 2001 he recorded a six song tribute to Harrison. James will be releasing the EP under the billing of Yim Yames and simply calling it Tribute To. The EP will feature songs of Harrison's from his days with the Beatles as well as his solo work. Yames' cover of Harrison's "My Sweet Lord" is really quite good. You can stream the six track EP in full at Yim Yames website and download the track "Behind That Locked Door" free and legal. You can pick up Tribute To when it hit stores August 4th. Download: Yim Yames - "Behind That Locked Door"